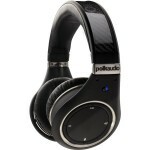 FocusCamera.com has Polk UltraFocus 8000LE Limited Edition Noise Canceling Headphones (White) for $149. Shipping is Free. Polk Audio are known for amazing audio technology and they have poured all of that knowledge into this pair of noise canceling headphones. They have been designed to not only sound amazing with full fidelity sound and deep bass, but to fit in seamlessly to your modern lifestyle. Advanced noise canceling technology and built-in controls for your iPhone or iPod make them your essential companion for traveling and commuting. The sophisticated audio technology is only matched by the superb comfort and superior durability which includes stainless steel, lightweight aluminum and carbon fiber to make the UltraFocus 8000LE last for years. These headphones feature Polk’s battery-assisted Active Noise Cancelling technology. ANC intelligently senses the sounds around you and changes the frequency response to compensate. This equals up to 15dB of noise canceling for an uninterrupted audio experience. In addition to active noise canceling, you get the benefit of passive noise reduction thanks to the super comfortable padded over ear design of the ear cups.